Well designed, constructed and maintained tracks will save you time and money. What makes a perfect track - six attributes your track should have. Tracks need to be wide enough for the herd to move without being pressured. Cows with enough space are less likely to push or be pushed. 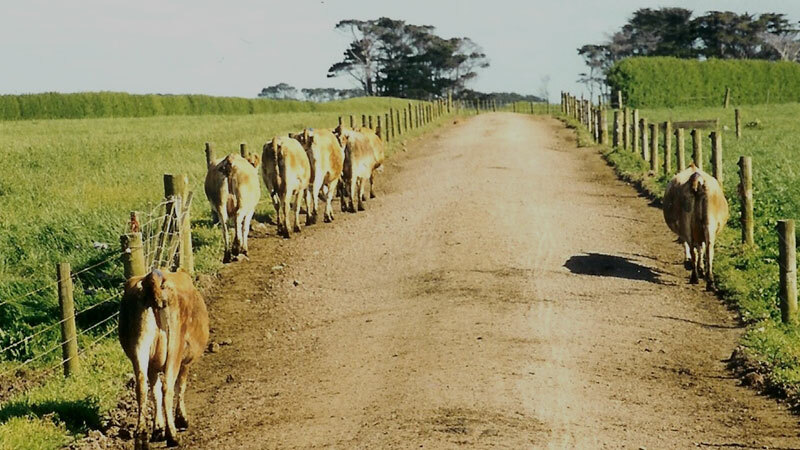 The width of the track is determined by the numbers of cows you have – or expect to have in future. Make sure cows don't have to walk too far. The longer the track, the greater the impact on cow comfort and the longer they take to get to the dairy to milk. 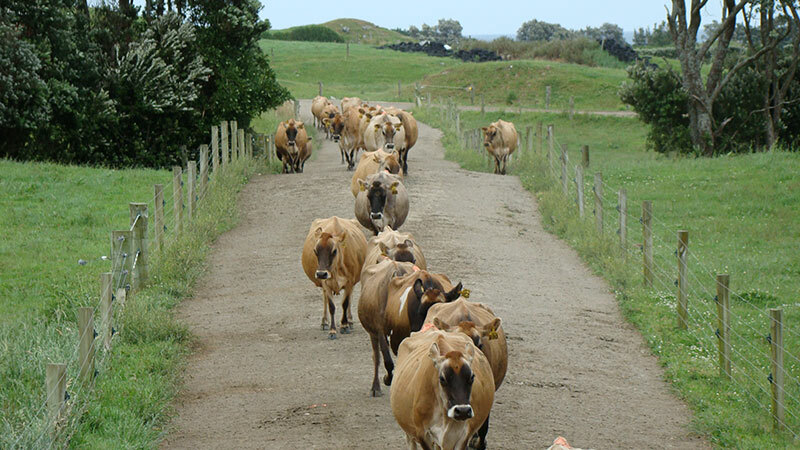 The energy being used by cows to walk to the dairy can affect milk production. Ensure there are no distractions. Distractions on the track will lead to cows stopping to take a look, potentially slowing traffic. 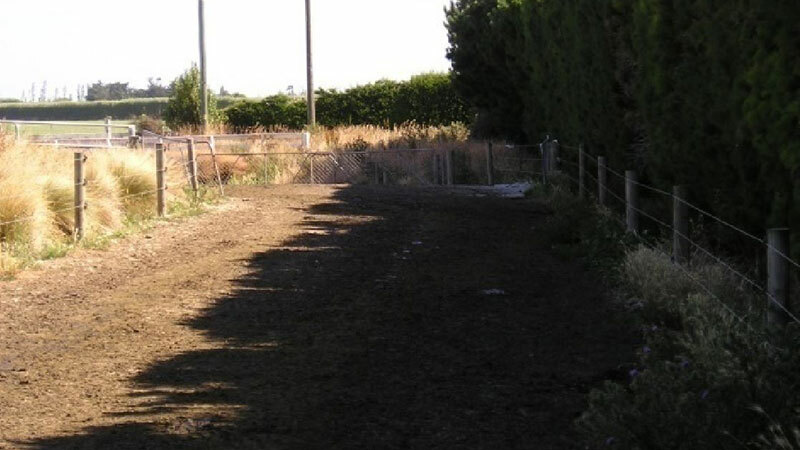 This track has no restrictions which will ensure efficient cow flow to and from the shed. This track has restrictions and distractions which will impede and slow cow flow. Make sure the track is well fenced from the drains. Good fencing can prolong the life of a track. It keeps cows out of drains, keeping them out of mud, minimising damage to drains and contamination of waterways. Position the fence so that the posts are on the paddock side but with an outrigger on the lane side of the drain. This track fence keeps cows out of the drains while allowing access for cleaning. This stops cows on the race walking in the drain. On the paddock side, it leaves clear access to clean the drain. Position the bottom wire high enough above the track surface to allow tractor access to the drain for cleaning. Also, take care when moving cows along tracks which are bordered by hot wire fences. 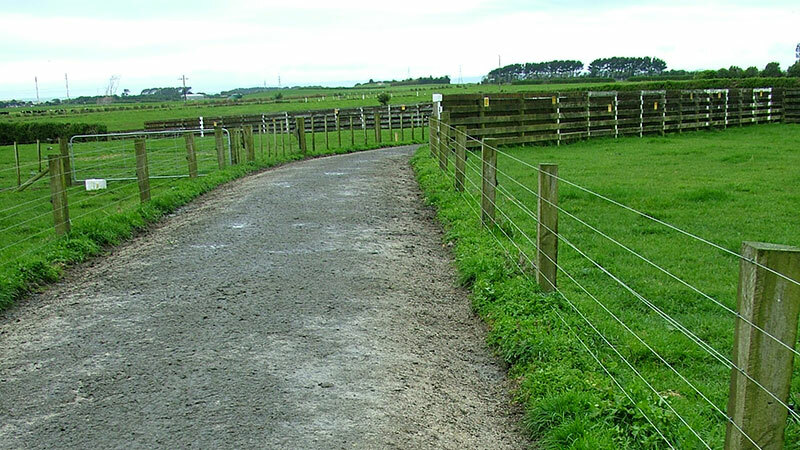 Access in and out of paddocks shouldn’t be narrower than the track or there will be bottlenecks. 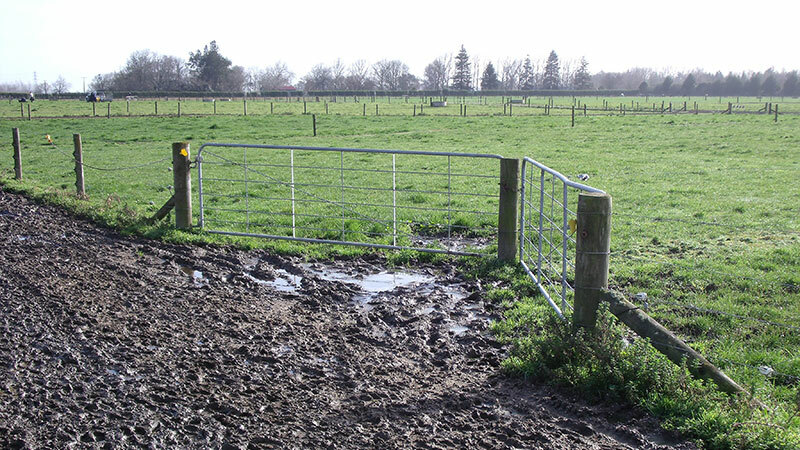 Put in double gates to avoid wear and tear and muddy areas. Angled or offset gates improve cow flow, reduce track wear and tear and are easier to get machinery through. 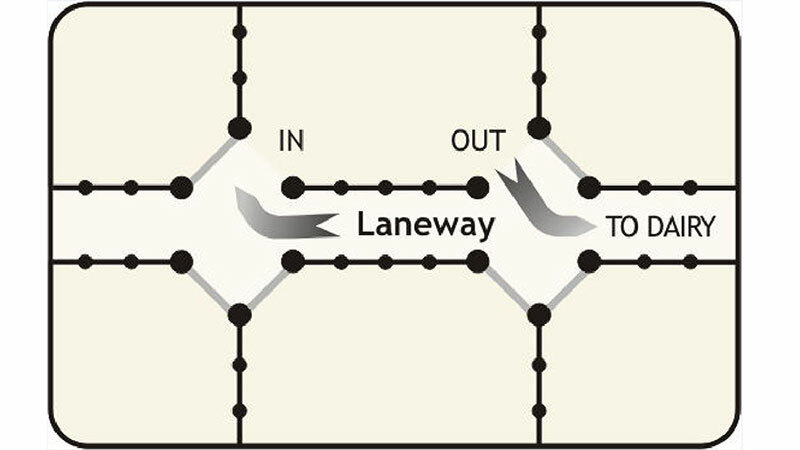 Open V gateways with access paths. Increase cow speed by removing the need to do a 90 degree turn onto the track. 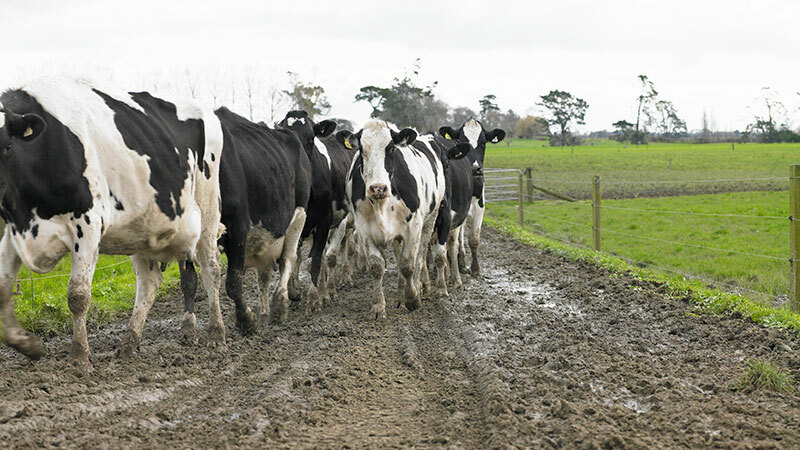 Reduce muddiness of gateways as cow traffic is halved. Provide better paddock to paddock access. Single wires are hard to see – use colour tapes for gates and indicator flags when using tapes across tracks. Move troughs away from the gate to stop drinking cows blocking the gateways and making them muddier. 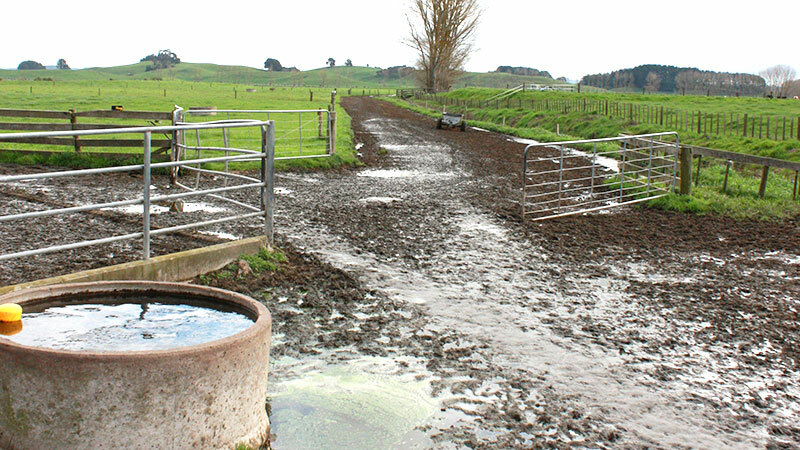 A full front opening paddock reduces mud as stock enter and exit. Time gate latches that drop the gate tape at a preset time. The timer is set when shutting the cows in. This encourages cows to begin leaving the paddock and drift off to the dairy at their own pace, rather than just relying on farmers pushing them along. Ensure effective gateway drainage to prevent mud. Divert water away from gateways and tracks; consider a culvert to carry water underneath. Heavy roll the areas around gates or troughs occasionally. Use two joined spring gates as a temporary gate for gateways or across races. The joined springs can be kept on the motorbike and will stretch across narrow or wide races and gateways. Track with good surface and appropriate camber. Cows walking on side of track because camber is too steep. Make sure the track has a good surface and appropriate camber. Tracks can’t be too muddy, uneven or stony or have too much slope or it will affect cows’ ability and desire to use it. Track drainage is best achieved by having a slight camber so water can run off. If you want to avoid run off for some reason (ie open drains or waterways), you can create a one way camber. But camber on both sides is better for cows. Ensure the track is raised in the centre and the slope should be between 3-5%. (Photo of correct camber/versus bad camber). Don’t make the camber any greater than 8% or cows will only walk on parts of the track. Maintaining good tracks involves having a proactive program that ensures drainage is effective and surfaces are kept in top condition. Muddy track caused by inappropriate surface and camber. Fill and compact potholes as they occur otherwise they trap water, turning the surface layer into slurry and the base layer into a bog. Grade track surfaces on a regular basis – at least annually. Using tractors or holding stock on tracks can lift and rut the surface. Drive farm vehicles slower on the tracks. Minimise shaded areas to ensure tracks dry more rapidly. Clean drains to make tracks last longer. Ensure any side drains are open when it rains and deal with small blockages as they occur. Carry a shovel when getting the cows in to clear side drains (and also at times, a knapsack to spray weeds). If grass and manure has built up on track edges and you wish to leave it to help support the track structure, cut lateral drains to allow water to flow away. To remove it, use a tractor blade – it may need to be done annually. Using a contractor with a grader or digger is a good option. Fix leaking troughs and irrigation equipment. Irrigators that run over tracks can cause problems. Prune or remove trees near tracks – they block sun and wind and keep tracks from drying out and roots destroy the structure. Create ‘speed bumps’ to divert water off steep tracks. Camber should be between 3-5%, steeper cambers result in water too quickly scouring the track. If you have a track next to a waterway, ensure it slopes away from the water towards a paddock or sediment trap. How well do you understand how cows move? When herding cows, an understanding of the way cows like to move is critical. Cows normally walk with their heads down looking at where they will place their feet. Cows prefer little physical contact with others as they walk. A cow that is left to move along quietly will seldom misplace a foot – even on a poor surface. Too many stones on the track. The cows are under pressure. When they do this they lift their heads and don’t watch where their feet going. If the cows are slowing down, they are doing it for a reason and the farmer should also. If they are pressured it will ultimately result in lameness. If the surface of the track is poor it will take cows longer. If the track is poor they will generally walk in single file. Cows walking to the dairy stick to their “social groups”. When dominant cows slow or stop, the entire herd will also. Cows have a slighlty different milking order to their walking order – give them tiime to reorganise themselves in the yard before they milk. Pushing them in too tight will lead to bullying and lameness. Cows don’t like to be isolated. If trying to separate one from the main herd, you may need to move a small group and then draft it.